As far as Bible translations go, I’m still getting familiar with the Christian Standard Bible. From my use though, I have really liked it. It seems to be another great option in literal Bible translations. Until now, I’ve had a thinline CSB Bible that I’ve looked at and it was a very nice Bible in its own right. However, when the opportunity came to check out The CSB Pastor’s Bible, I jumped on it. I have never used a Pastor’s Bible before, but after looking at this one, I can see how valuable they are. We will get into the features soon, but let me just say from the start that Holman has created a nice bible here. There are typically things I like and dislike with any Bible—there is no perfect Bible—so let’s start with the negative and we’ll finish with the positive. For whatever reason, my preference is a black Bible. The Pastor’s Bible comes in a brown genuine leather and what they call a black “leather touch”. The copy I received was the latter. 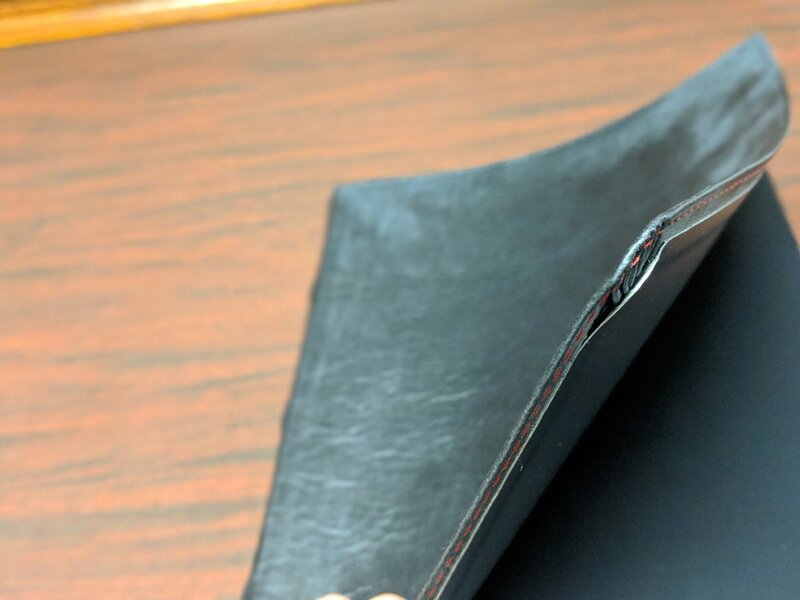 I’m not sure if the leather touch is supposed to rival the ESV’s TruTone leather, but what I am sure of is that I’m still not sure if I like it. The feel when holding it is a little different. I’m not sure how to describe it exactly. I wish this Bible had a black genuine leather option as I think it would be preferable. That being said, I do think the cover looks attractive, but something about the feel throws me. This was happening on both the top and bottom corners. Turning to the inside of the Bible, the corners on the binding of the copy I received seemed to be coming loose on the front cover. They were separating and I questioned when that would cause the rest of the inside to separate. I’ve included a picture so you can see what I’m talking about. I proceeded to use some super glue to secure them and I don’t think it will be an issue, but that’s not what you want to see out of the box. I examined another copy and it didn’t seem to have this issue so maybe mine just happened to have this going on. The back corners seemed secure enough. Maybe it would have never led to a problem and I’m just being nit picky, but you are reading a Bible review after all. With those two minor complaints out of the way, let’s move on to the positive and I do think there’s plenty positive to talk about. The first thing I noticed about this Bible was something I was a big fan of. It comes with three ribbon bookmarks and they are all different colors. If you’ve read other Bible reviews I’ve done, then you may know that I like plenty of bookmarks and I do prefer that they are different colors. The Pastor’s Bible knocks this out of the park. 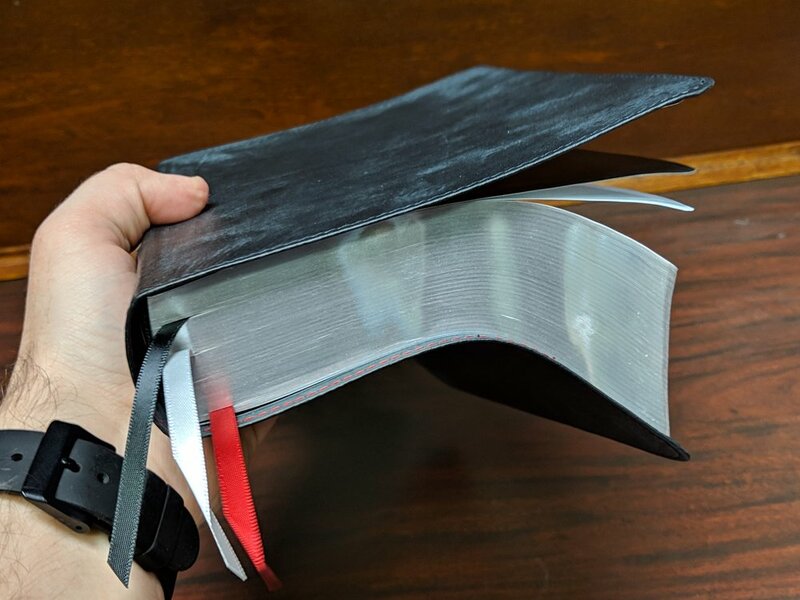 With the black Bible, the black, white, and red bookmarks provide an attractive color combination and are a very nice feature on this Bible. Another feature that jumps out at me when I open the Bible is the generous font size. 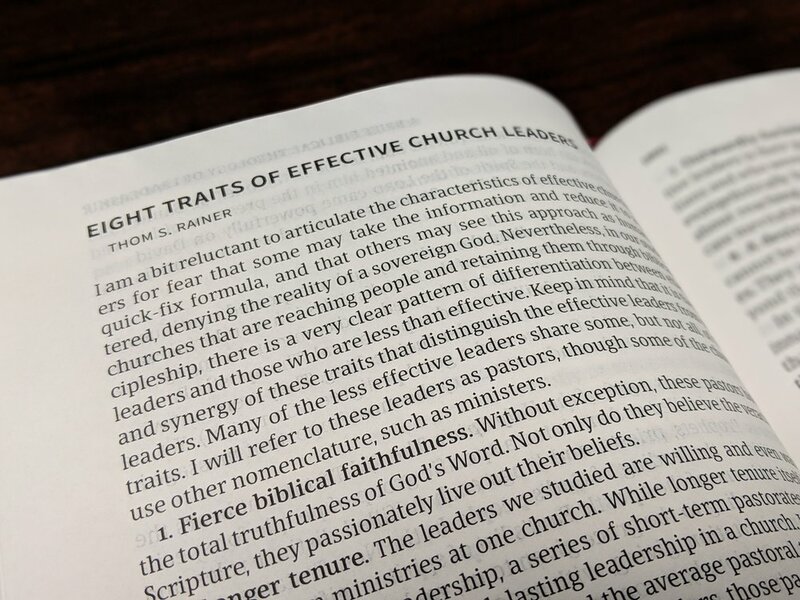 When I’m preaching or doing pastoral work, I like to not have to be able to strain to see the text. The font in this Bible is a nice eleven point and jumps right off of the white paper. An eleven point font size certainly makes this Bible a little thicker, but is completely worth it in my opinion. This is a single column Bible, which is not everyone’s preference, but it is mine. I prefer to use a single column in both study and preaching. One thing I wish this Bible had was wider margins, but that would add to the thickness of it and it is already a decently thick Bible. 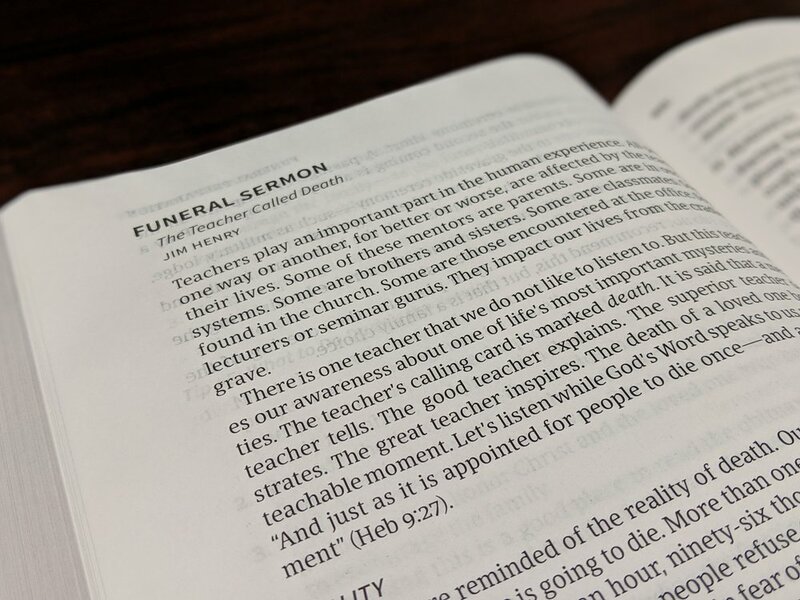 Sometimes sacrifices have to be made to keep weight and girth down, but wider margins would be nice in a Pastor’s Bible since a pastor may want to have notes written down for by certain texts he may frequent when doing ministry. The other thing one will notice is that this Bible has a fair amount of ghosting when it comes to the text on the opposite side of the page. That personally is not something that usually bothers me, but I know it will bother some and is something to be mindful of. The real highlight of a Bible like this is the helpful articles and service outlines. I’m very impressed with the quality of the content included in this Bible. 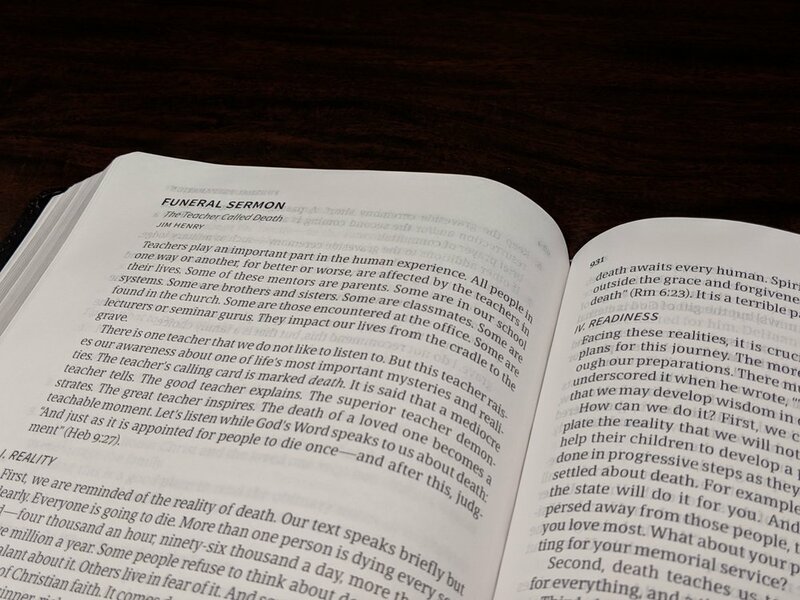 Between the Old and New Testaments you will find funeral and wedding service outlines and notes. 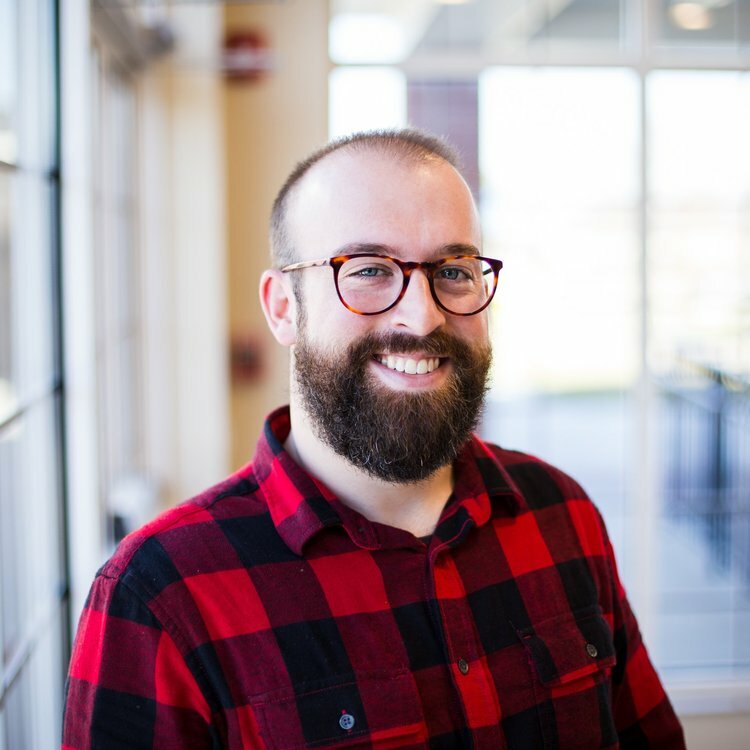 At the end of the Bible you will find articles to help, teach, and encourage pastors from the likes of Matt Chandler, Jared C. Wilson, Charles Spurgeon, Thom Rainer, etc. (I’ve included the full list below). Having these in a Bible with you at all times while out doing ministry make this Bible worth the price. I haven’t yet, but fully plan to read every article included within this Bible. 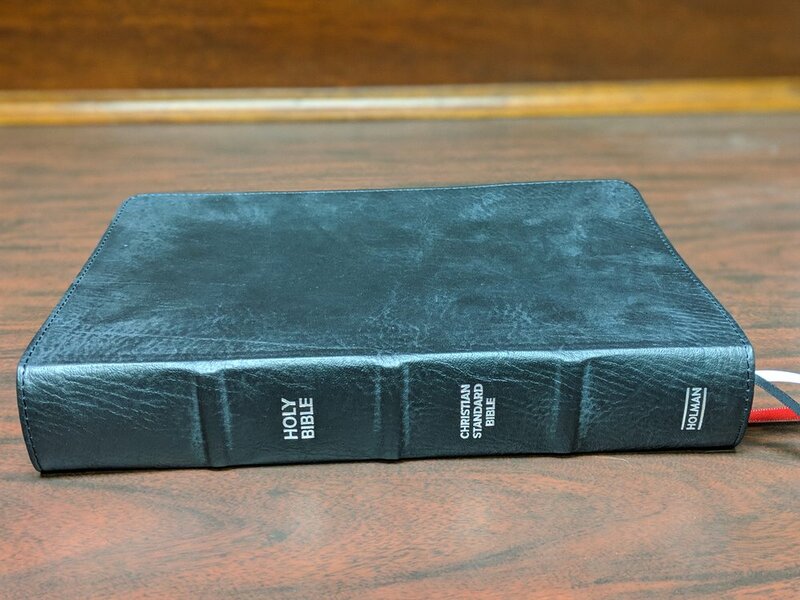 I haven’t used or reviewed the ESV Pastor’s Bible, but I can say that I think the CSB sets the bar high. This is a really nice Bible at what I think is a very affordable price for all that you get. I have no trouble saying that I would highly recommend this Bible. It’s beautifully constructed and contains a lot of help for the pastor on the move ministering to his flock. You can buy the CSB Pastor’s Bible here on Amazon. Disclaimer: I received a free copy of this Bible in exchange for a fair and honest review.